Mention sea-holly, or eryngium, to most gardeners, and ‘Miss Willmott’s Ghost’ will probably spring to mind. The eccentric Edwardian plantswoman and garden writer Ellen Willmott is said to have been so enthusiastic about the merits of Eryngium giganteum that she would surreptitiously sprinkle seed of it in any garden she visited. Two years later the garden would be full of reminders of Miss Willmott’s visit. The plant is one of the sea-hollies, that have flowers with a central cone surrounded by bracts in the form of a frilly, often spiky, ruff. On many varieties the ruff and flowers, sometimes the stems, are metallic blue. Most eryngiums flower in that lull between the plenty of mid-summer and the start of the autumn-flowering perennials. 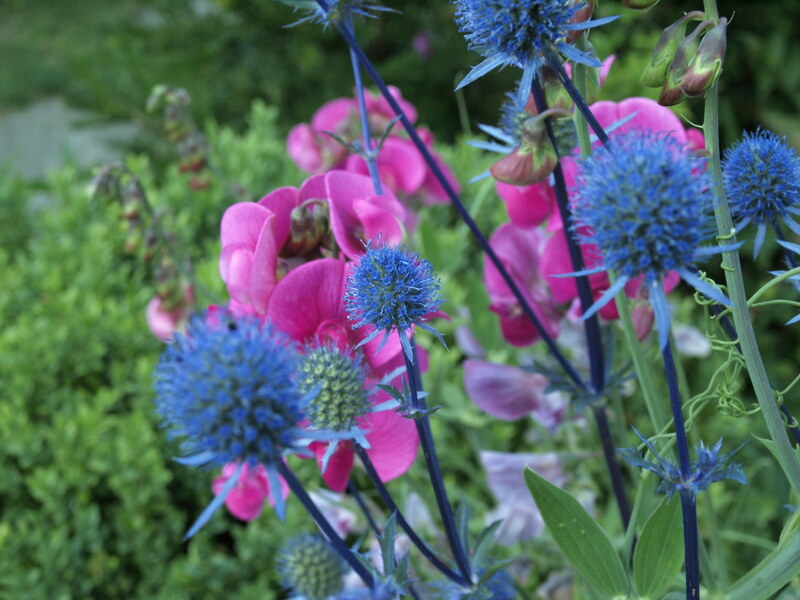 Seeing the intense blue flowers on garden visits or in show gardens, it’s easy to be seduced into wanting them in your own garden. Unless your soil is very well-drained, though, you will be disappointed. In rich, moist soils they will flop over, rot away and rarely fulfil their promise to reappear the following year. While their tough foliage can resist, slugs, snails, rabbits and even deer, over-watering or sitting in heavy, clay soils will finish them off. A gravel garden provides the ideal growing conditions and they revel in the conditions of our current hot, dry summer. Eryingiums look their best with other plants that need to be grown in the same well-drained and sunny situation. Their colour appears even stronger when grown alongside the sizzling red and hot orange flowers of Crocosmia and Kniphofia. For a more pastel colour scheme try planting them through silver artemisias or among the soft blue-grey flowers of Perovskia atriplicifolia. 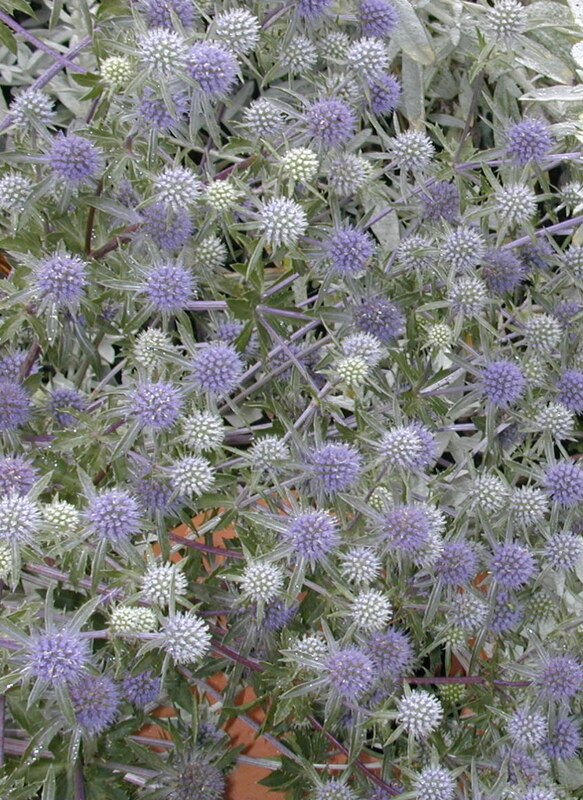 The blue-flowered species of eryngium are native to Europe and parts of Asia. Native to North and South America there are several species that are much more suited to wet winters and heavy soils. These all have small green cone-shaped flowers, usually on imposingly tall stems that can reach 3metres tall. Their bright and succulent foliage adds freshness to borders that are beginning to tire in the heat of summer, while their height brings a commanding presence to the border. Grow them in groups to make a bold statement or dot them individually through a border for dramatic punctuation. Few gardens have the range of conditions to accommodate both groups of sea-hollies Choose the ones best suited to your garden. Either group, through intensity of colour or through bold structure, will bring freshness and energy to the summer garden.